If you have not seen the greener part of Bangalore, you have not visited the Lalbagh Botanical Gardens yet. 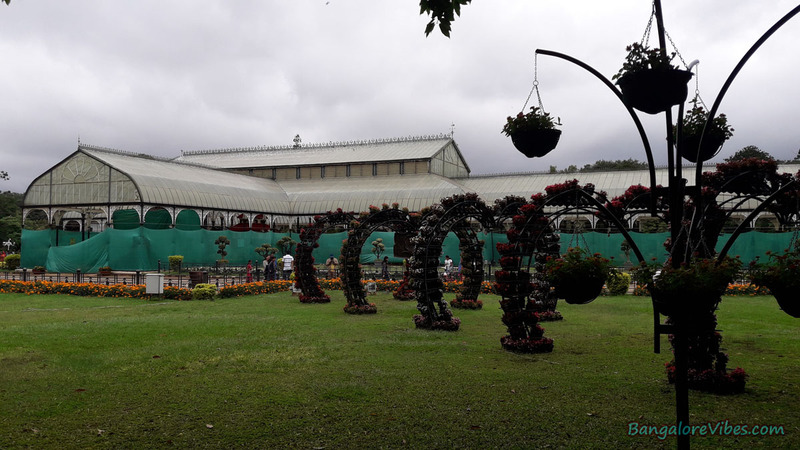 Rush to the Lalbagh gardens on or before 15th August 2017, you will not only breath fresh air but also witness one of the most beautiful flower show in entire India. 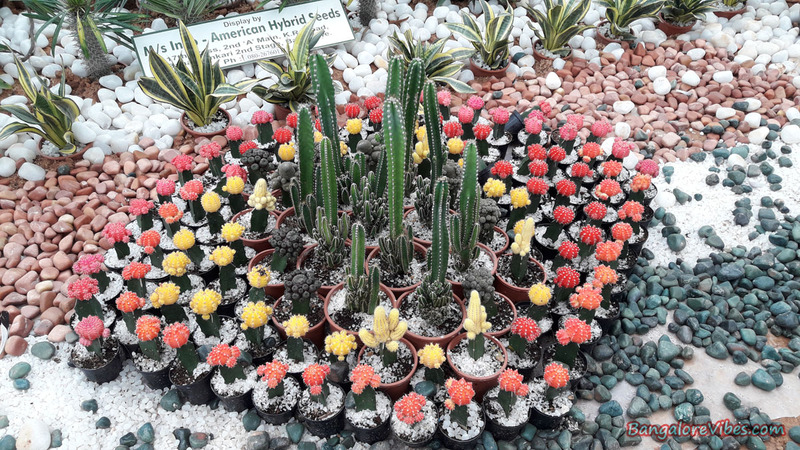 The horticulture department organizes the flower shows two times a year. One during the Republic Day and another during the Indian Independence Day. The ten days flower show is open to the visitors well in advance and ends during the main event. The entry fee to the show is Rs. 50 for an adult and Rs. 20 for children. During the weekends, the prices increase by Rs. 10. However, children go free during the Independence Day. The right time to visit the flower show is during the weekdays. I prefer to go in the weekend due to my work schedule and the best time to be there is at 8.30 am when the tourist inflow is less. It is always fun riding the Royal Enfield Bullet in Bengaluru when there is no traffic. Saturday mornings are the best time. Though it was the shortest one, I thoroughly enjoyed the ride to the garden. I was in the Lalbagh north gate by 8.45 am. For those who are new to Lalbagh may face parking issues while attending the flower show. The horticulture department has banned parking inside the garden during the show days. However, there is an alternative arrangement, in a multilevel parking complex near the Shanti Nagar bus terminal. Elderly visitors and those who have walking issues may face difficulties in reaching out to the glasshouse. Even those carrying children to the flower show may face problems. However, there may be an alternative arrangement to oversee these issues. I did see there an electric buggy and a medicine dispenser yesterday. I usually start exploring the stalls from the left. 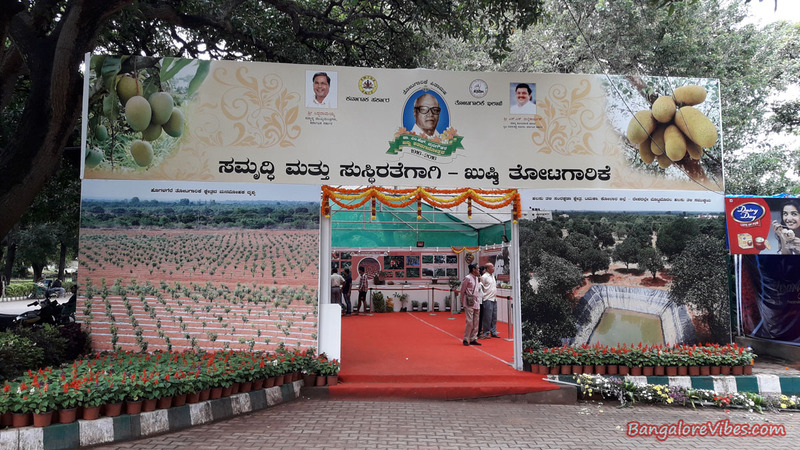 Unlike every year, the first stall displayed agricultural produces and information that are useful to the farmers. This time, it was about the dry zones of Karnataka and the problems faced irrigating it and the measures for successful dry land agriculture and the assistance available to the farmers from the concerned department and so on. 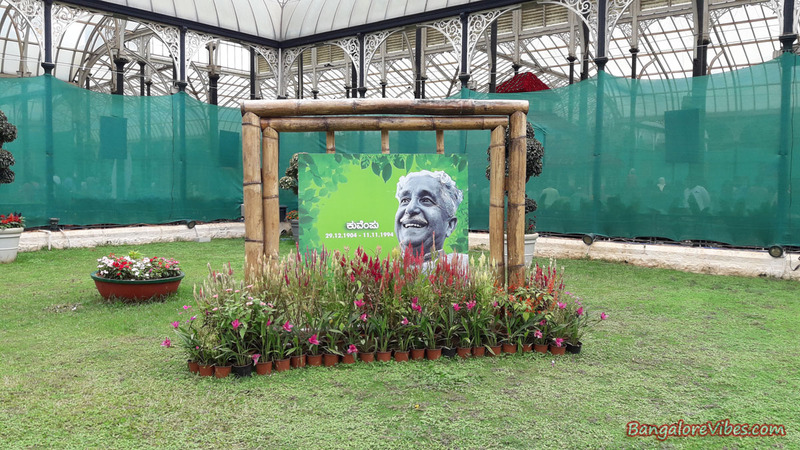 The photographs of Dr Marigowda, the father of horticulture in India was also a highlight here. 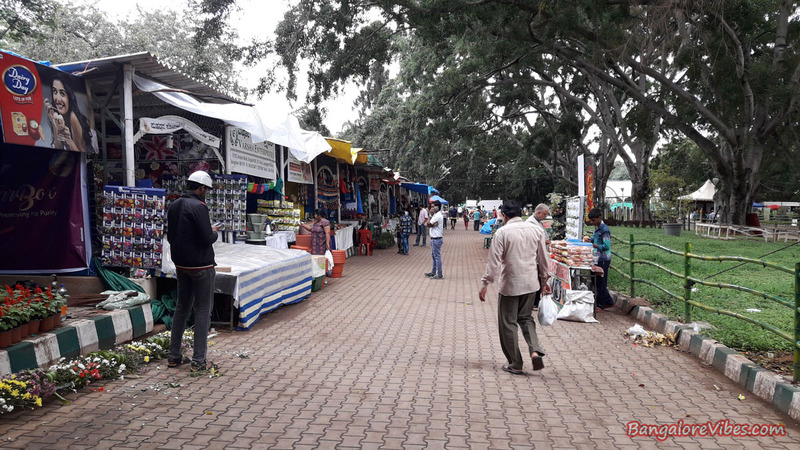 There are several other stalls spread across the garden catering to the varied needs of the visitor’s right from pickles to the horticulture essentials. Traders from different parts of India have rented out stalls here to sell their produce. There were different varieties of homemade pickles and snacks, farm bred honey, kitchen utensils, copper wares, clay pots, herbal products, oil and spices, fancy items and the list goes on. 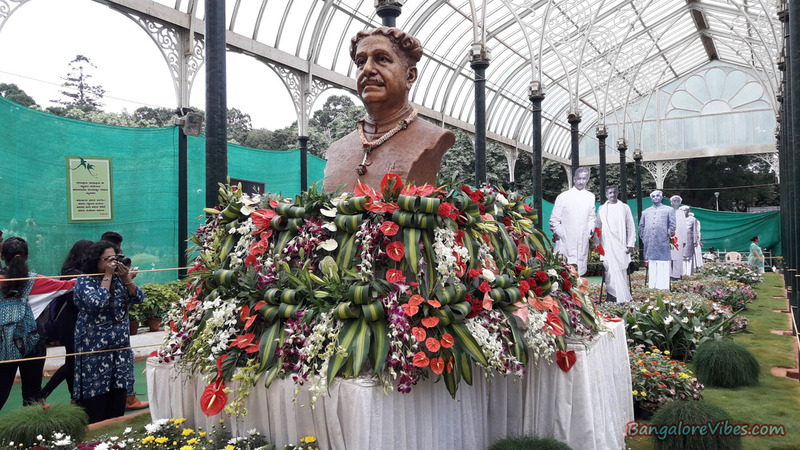 The center of all attraction is the house of our National Poet Kuvempu painstakingly created out of millions of roses and other beautiful flowers. This is one of the best thing available to see in Bengaluru this Independence Day. 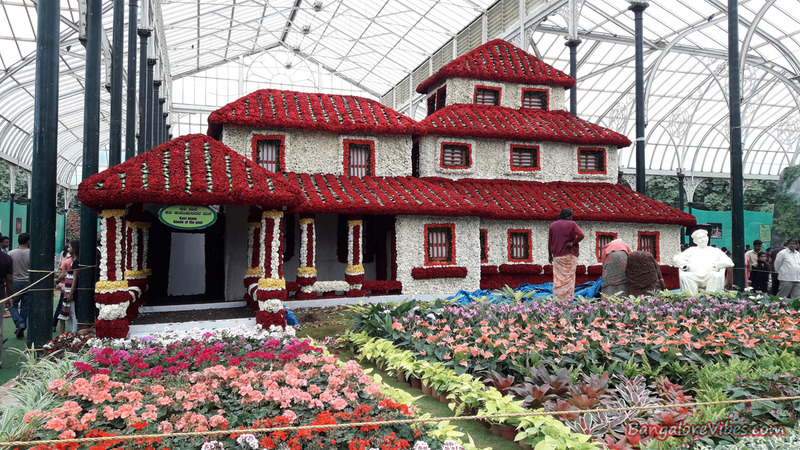 However, you have time until 15th August to witness this spectacular flower house. 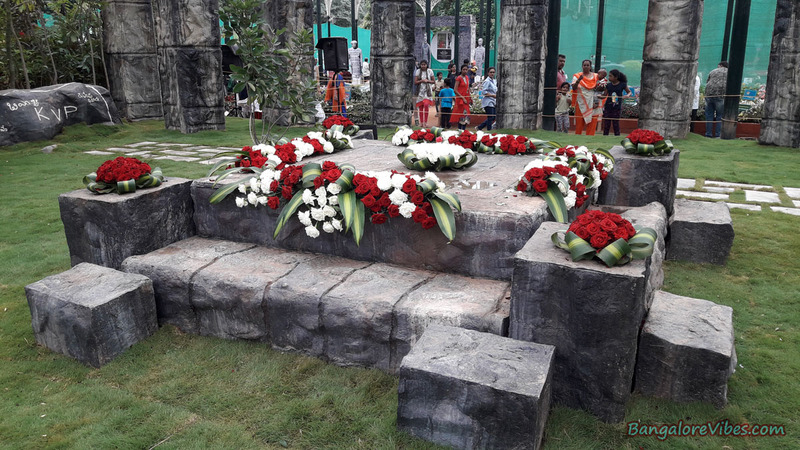 Just behind the floral house was a tomb (replica) of the poet. The beautifully erected stone formation makes a great background for the photographs. I mean, for selfies! Wouldn’t you love to take one? 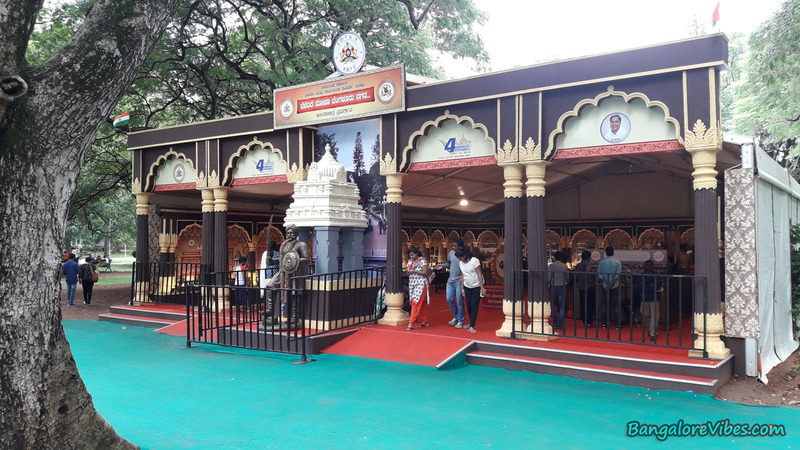 There was this venue next to the glasshouse displaying the photographs and artefacts highlighting the growth of the garden city, Bengaluru. The artistically created mini replicas of schools, house, farmer & bull, and a family eating together is something that children will enjoy seeing it. 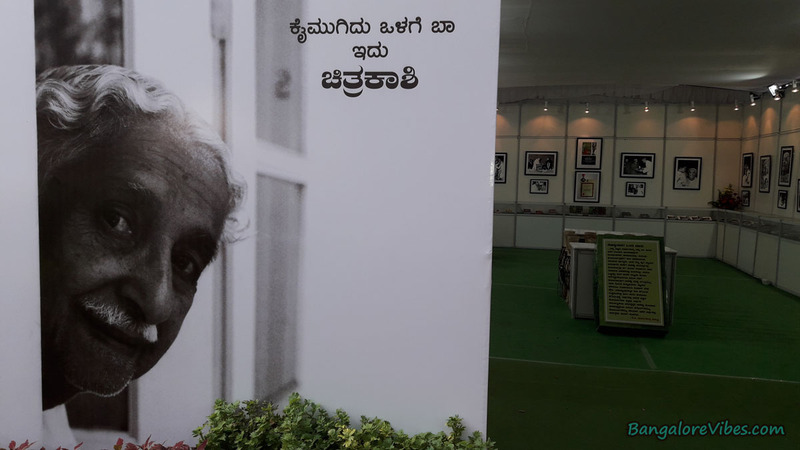 This venue dedicated to the National Poet Kuvempu has rare collections of photographs of Kuvempu with his family, grandchildren and other eminent personalities. There was in display a collection of books written by the great poet. There was some floral decorations near the bandstand also. The visitors were everywhere enjoying the flower moment. Lovely photos, and interesting post!